Our Off-Peak Play Pass is a fantastic way to make the most of our great centre and is an ideal gift for pre-school and home educated children. Pass holders can visit us Monday – Friday term time, ANY TIME with any accompanying adult and your pass is valid at all seven of our UK centres! You can also enjoy 10% off all food and beverage purchases. Grab your pass online for 33% off At £63.65 this is the best deal around! This exclusive offer is online only and there are only a limited amount of passes available so don’t miss out. If you’re an expectant parent or have a baby or toddler make sure you don’t miss out on our free Parent & Toddler Fayre at 360 Play Basildon on Wednesday 1st May. Anyone attending can enjoy free entry into the centre from 9.30am-2.30pm. This is a great opportunity for local families to attend informative workshops, browse stalls from local businesses, find out more about local toddler classes and nurseries and so much more! There’s all the usual 360 Play fun to be had too making it a great day out for young families. 15% OFF online tickets – includes free registration. Tickets are booked for specific days, must be booked in advance and cannot be purchased online on the day of your visit. We release a limited number of discounted tickets for sale online. Even when online tickets are sold out there is still a large capacity of full price tickets available in store for purchase on the day of your visit. All customers of 360 Play must register with us. Membership registration is a one-off payment of £5 per family group. Speed up your first visit by pre-registering HERE. Take the NIBS number 237 bus from South Woodham or Basildon Hospital to the Festival Leisure Park. The nearest train station is Basildon which is 10 minutes away in a taxi. We visited this 360 a few weeks ago. Very impressed! My son is about to turn 2 and until now I had not visited here as I thought the entrance fee to be a tad expensive for the amount of play he would actually be doing.... now that he is a little older and much more physically and mentally able to play I thought I would give the place a try. Well we ended up staying all day! Even doing nap time here and then waking up for another play and lunch! I loved the fact that there were lockers to lock my belongings in so that I could easily go and interact with my son on the play frames and in play street without having to worry about my belongings. Also loved the fact that the play frames are all adult friendly and its actively encouraged to use them with your children. My son loved the play frames and especially play street. He had a few goes on the carousel ride which is great as it is next to a huge window and he loved that he could look out over the leisure park. The lady manning the ride also interacted with my son a few times which he loved. One thing that stood out to me was the cleanliness of the centre and the fact that staff were actively cleaning all throughout the day too. We will definitely be returning....we had a great day! I would like to take a minute to compliment some members of staff too.....Luke spent most of his day tidying up after my messy son!! and we want him to know that it was much appreciated! The play street was in great order with everything where it should be thanks to him. Luke was seen meticulously cleaning things aswell.... Lovely to see a member of staff actually cleaning things properly too rather than just a quick wipe over with a mucky duster as can be seen in other centres sometimes! I must also mention Becky/Becca who was working in the canteen area on this day.... she was a very pleasant and smiley girl! Lovely to talk to and nothing was too much trouble.... she had such a pleasant and friendly manner that both me and my friend commented that it was a breath of fresh air compared to some play centres! We will definitely be returning soon! Come here all the time. My 4 year old loves it and there is so much to do. In the summer the outdoor area opens up so my son gets to enjoy the sun too. The staff are always friendly and polite - can't ask for much more. Best soft play area for miles. Buy your online tickets in advance at discounted prices! There’s an eggstravaganza of prizes to be won all over the weekend from Friday to Monday* inclusive, with an Annual Peak Pass on offer each day at each centre. 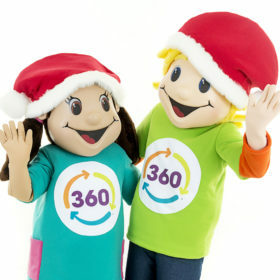 *360 Play Town in Redditch is closed all day Sunday 21st April. This is NOT an April Fools! We really do have Christmas packages available for you to book NOW! Visit our Offers and Events page to find out how you can celebrate Christmas in the home of fun and buy your tickets.